As Serious Chai makes you feel good, you can feel good about Serious Chai, because we don't use any preservatives, artificial flavors, or substitutes of any kind. 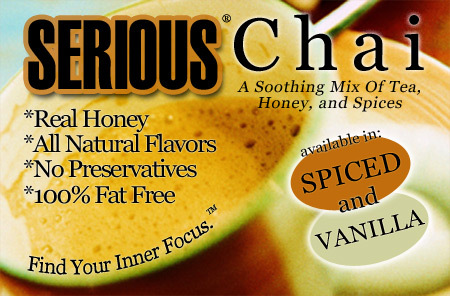 Serious Chai uses real honey, all natural flavors and is 100% fat free! No hydrogenated oils - no trans fats! And because our Chai is formulated to be prepared with milk instead of water, YOU get to control your drink preparation for yourself (or your customer). Fat free chai latte? No problem - just prepare with skim milk!